Grew Up… in Toronto. Her parents weren’t incredibly supportive, usually dismissing her interests. That may have spurred her need for approval. Living… in Dog River, Saskatchewan. The small town is about as different as possible from the big city of Toronto, and much of Lacey’s time is spent trying to adjust to her new surroundings. Lacey owns her own home and lives alone, but spends most of her time at The Ruby. Profession… owner and main operator/waitress/cashier of The Ruby, a diner she took over from her deceased Aunt Ruby and renamed in her memory. Lacey has one employee, a cook and busboy named Josh. 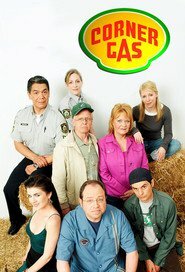 The diner is adjacent to Corner Gas, the only gas station within 60 kilometers, which is run by the sarcastic Brent Leroy. Interests… there’s not a lot to do in a small town, so her free time mostly includes chatting with the other townspeople and meeting at the local bar. Though Lacey is surprisingly adept as a hockey coach, possessing a vast knowledge of the sport. Relationship Status… single, but often looking. Her prospects in Dog River are scarce, and she bemoans this fact periodically. Before Lacey moved from Toronto she had a fiancé, but she felt he wasn’t “the one” so she chickened out by calling his parents to cancel the wedding. Lacey wants to get married eventually, but has no desire for children. Personality… stuffy, hard-headed, easily embarrassed, and persnickety, but still somehow lovable. Lacey wants to get her way but often fails to do so. She can be a sore loser and a gloating winner, as well as a bad liar and confidante. She’s so eager for acceptance and approval that they can be hard for her to come by. Even so, The Ruby just wouldn’t be the same without her around. Lacey Burrows's popularity ranking on CharacTour is #3460 out of 5,000+ characters. See our top-ranked characters and read their profiles.